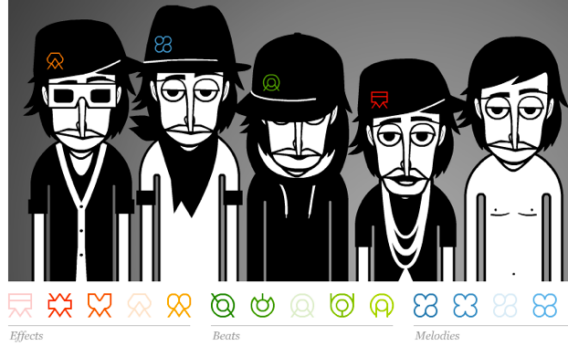 The dapper beat-makers of the Incredibox. Still of online music-maker Incredibox. Can a game still be great if you can’t do anything wrong? New French music-making game Incredibox proves that the answer is yes. As Laughing Squid points out, the simulator is the product of a a collaboration between multimedia studio So Far So Good and musician Incredible Polo, and the product is a wonderfully surreal free online game that’s as rich in details as any online music-maker I’ve seen yet. The setup is simple. Once the game is done loading (be patient, it’s worth it), all the user has to do is mix and match musical elements (different beats, different melodies), and let the game repeat the loop. Incredibox won’t give you any points for your creations, nor can you run out of lives, but all the elements are pre-arranged in the same tempo and scale so that you can’t possibly play a wrong note. It’s a bit like the great Daft Punk simulation iDaft, online sequencers such as Otomata and iNudge, or even Björk’s iPad apps—except with more shirtless French men. Indeed, what makes Incredibox so fresh is its bizarre combination of attitude and silliness. Each new band member emerges clothed solely in a goatee; only when you assign them a musical part will they suit up in corresponding outfit, complete with silly hat. I’m not sure why, but the look of the cartoons seems to me undeniably French. Gizmodo compared Incredibox’s all-vocal music to the songs of Bobby McFerrin, but I wouldn’t be surprised if the band picked up cigarettes and started smoking to Serge Gainsbourg. Update, April 15, 2012: According to the Incredibox’s Facebook page, the site has been overwhelmed with traffic and is currently down—they hope to have it back up and running soon.